Designed specifically to fit the HK MSG-90 (.308 / 7.62 X 51). This model fits only the HK MSG90. These were made under special contract for a foreign tactical team that wanted to continue to use their Heckler & Koch MSG-90 sniper rifles, but needed a longer rail in order to mount Night Vision (PVS-27s) in front of their daylight scopes. We only made 4 units which cost us more than $11,500.00 in RND costs. So we are selling these at a loss just to get them into the market and see if there is a need to make more. Unfortunately the cost to make a short run is not cost effective, but then the HK MSG 90 is not cheap either for the same reason. This is the ONLY MSG90 scope mount on the market that allows the use of any Night Vision with a conventional daylight sniper scope. It is also the longest scope mount ever made for the MSG/90. MFI has a long history of being a Licensed BATF 07 Manufacture with a SOT / Class II & III. This item will fit without modification to any HK MSG-90 (NOT the MSG90-A1). The above photos shows the MFI HK MSG 90 20" inch long Scope Mount. The daylight optic is made by US Optics Sniper Scope (Thanks Steve @ US Optics) and the PVS-27 was furnished as a loaner from our good friend Guy at FLIR. Made Specifically for Foreign Sniper Team to T&E. The main criteria being extra length. You can also pull back on the cocking handle no problem. The ability to lock the cocking handle it in the "SAFE" position depends on the location on the rail of the Night Vision Scope. The rail height is as low as possible and still allowing full use of the entire length of the 1913 Mil. Spec. Picatinny Rail. We could make it lower, but then the slots above the hard mounting points would be negated as there would not be clearance for the scope rings to grab. We also had to keep this height as the PVS27 night scope drops down below the top of the rail. 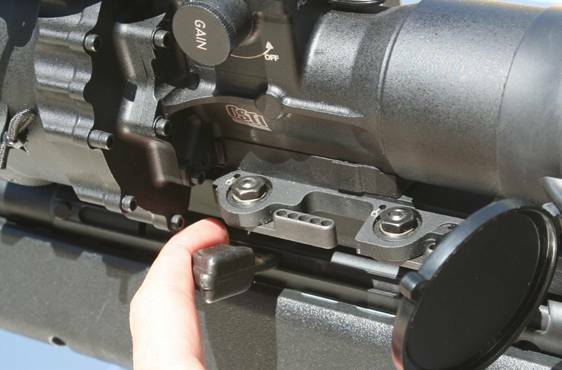 The rail makes contact only with the 2 hard points found on top of the receiver that are unique to the MSG90 weapons system. So the entire front end of the rail FREE FLOATS over the top of the cocking tube. These same hard points are used on the HK21 machinegun and on the MSG90A1 / MSG 90-A1, but the rear sight will be in the way of the rear portion of the rail. This portion could be cut off if needed, but the added length to the rear was also a requirement in the contract. Note that the attachment mechanism is NOT a quick release style like found on the original HK mounts. This was also a requirement to avoid accidentally being un-locked. Weapons Grade Hardened Steel Mounting Points / Blocks Mil. Spec. Black Oxide Coating. 19.80 Inches ( 502.9mm ) Long. Low Profile Rail Height @ 0.760" ( 19.30mm ). 2 - Independent Locking Clamps for 100% Secure Attachment.